As always, skim down and stop when your interest is caught! Too lengthy for a “blog” this is rather more a journal, and I post once a month only, so end up squishing too much together! If you are wanting just a quick look over some images, it’s easy to scroll down. The wonders of mobile phones! I have sown various seeds in the garden, and the snails are eating the little shoots as they shoot! I don’t like slug pellets and I don’t use them. Well, it’s not quite the sunflower stage of the year, but oh how generous is the bloom and how strong the stalk of the sunflower, and how it lifts my spirit to even think of a sunflower. I love the motif of a sunflower, and use it in a lot of my painting and drawing. The Sunflower image below is one I have used for several experiments, including using the sunflower for a surface pattern design. Nothing very clever, but sometimes the simple things can be most effective, and it is rather exciting to see more of something that you like splattered all over an item of some kind! I love creating patterns with various adaptations of my paintings and photographs. There’s something very satisfying about bringing a strong pattern into play…While my painting with it’s rich colours and textures, the interplay between the two, and the subtle nuances of light and surface, which take me into the realm of the unknown and the unpredictable, there is something very reassuring to be found in a repetitive pattern! It’s a completely different experience, but very enjoyable. I am hoping that in time, more of my art work will be licensed, because I like to see it used. 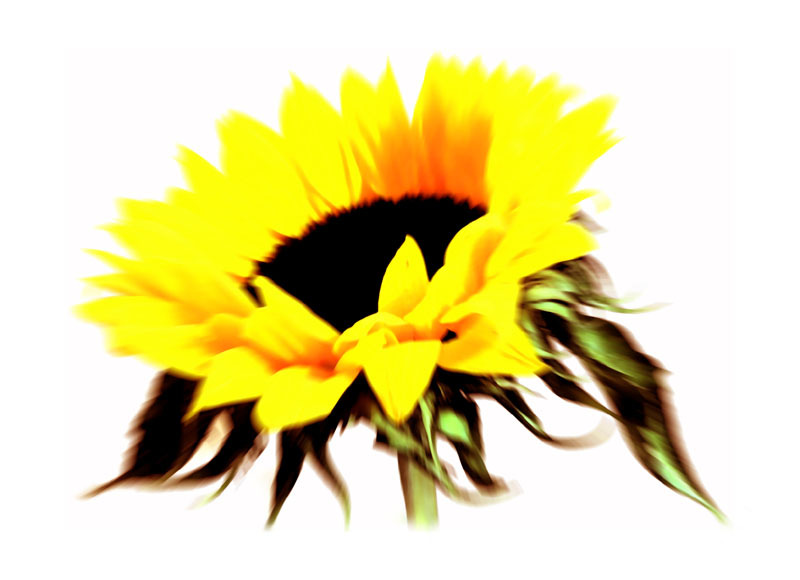 Looking at this page, I think if you go to the portfolio link, you will then arrive at my main Jenny Meehan Redbubble Page and if you click on the Sunflower image you will see all the other products which can be purchased via Redbubble with this Sunflower design on them! 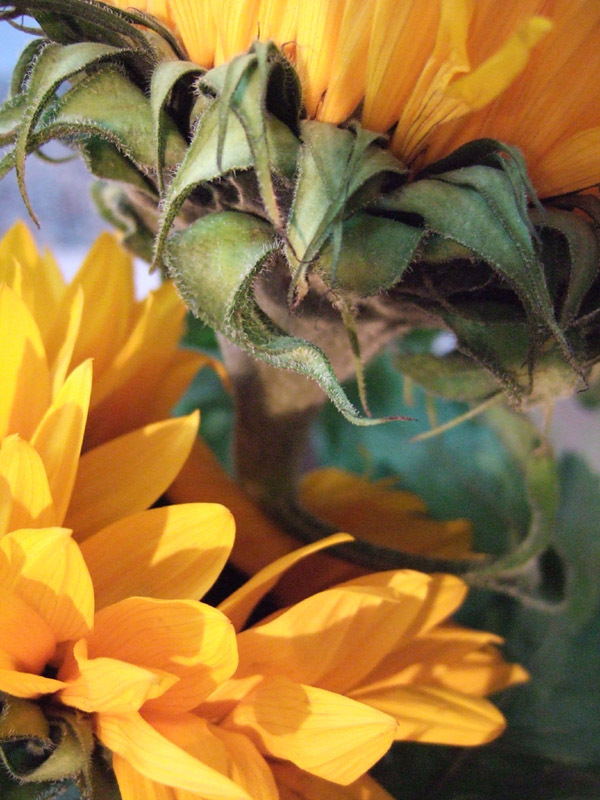 The sunflower as a symbol has often been used to represent the unwavering faith that guides a soul to higher spiritual attainment, though what the sunflower symbolises is different depending on which culture you are looking at. However, I rather like the faith version! Sunflowers have been in existence since ancient times .A carbon dating was done to some clay found in North America, which seemed to have some kind of seeds in it, and the dating showed both that the seeds were sunflower seeds, and also that they dated back to a period of time approximately 3,000 years ago. 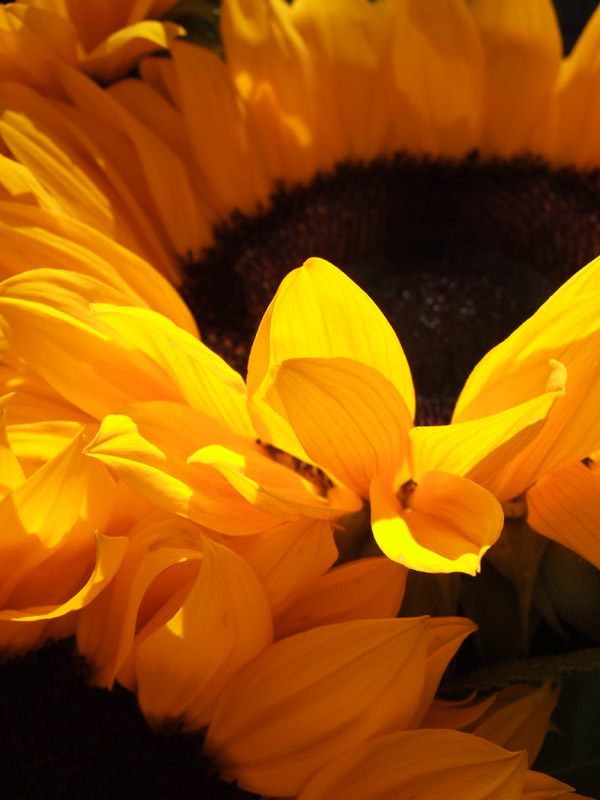 The shape of the sunflower—the large disk in the centre and the ray-like petals emanating from it—resembles the sun. The florets in the centre of the sunflower, that later become seeds, are arranged in a complex pattern of left and right spirals and are placed according to the Fibonocci mathematical formula. The resulting pattern is not only beautiful, but it is practical too, being the most compact way that the florets can be fitted. It is just one of the many marvellous details in nature that point to the goodness and wisdom of God. Though you cannot see the seed pattern in this design, I hope that the bright, fresh, boldness of the design will strike you with its flash of uncompromising yellow. The flowering time for sunflowers is from around May to October, so some of them do flower much earlier than I have in my mind…They always make me think of the late Summer. 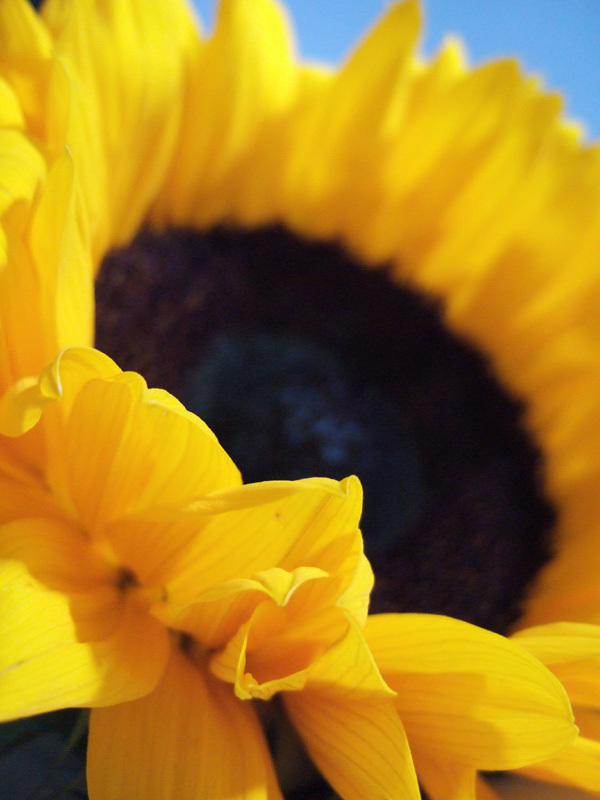 Another name for sunflower is Helianthus, and in the Greek, the meaning of “helios” is sun and “anthos” means flower. The way that the Sunflower faces the direction of the sun is something that a lot of flowers do, but I guess because it is rather a big flower, we notice this fact about it more vividly. This drawing was one of the results of a spontaneous quick drawing session. I armed myself with a large pile of paper and drew quickly and without any preconceived ideas about subject matter. I was interested to see what would come from my subconscious. What did come were several landscapes, loose and flowing, which I will share another time. But “Sunflower and Rose Bowl” was the one which interested me most. 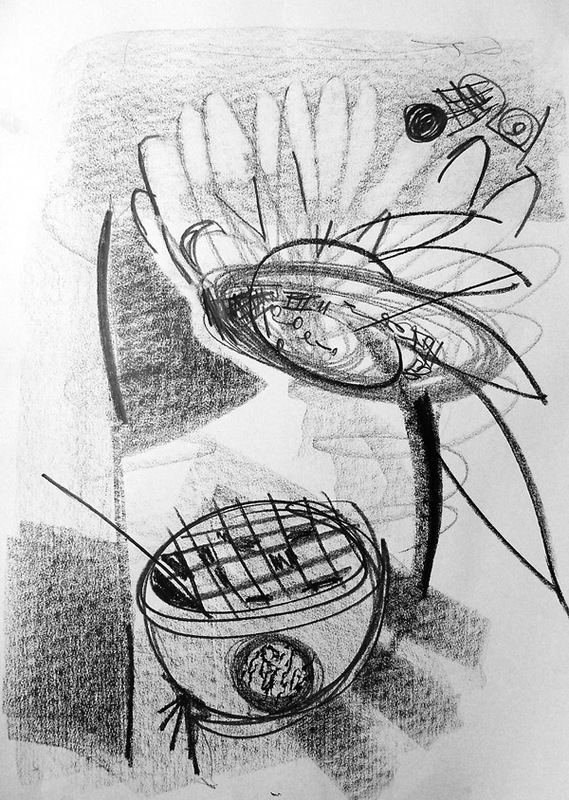 There are rays of light indicated as coming from the left of the drawing. The Sunflower springs up from a distant point far below and it’s centre echoes some random, rather creative, patterns at the top right of the drawing. Below the Sunflower is a bowl which contains just one empty and thin stalk, and that alone. To my thinking the drawing shows a contrast between life, and the life force, like powerful light pushing upwards and radiating outwards, and, in contrast, the grid like pattern of the wires on the restrictive rose bowl, holding that one thin and flowerless stalk,which though more dimensional, is more static and less promising. I wondered at one point if the sunflower was foolishly looking at the rose bowl and wishing to be contained, but finding itself too big and not in fitting with the rose bowl. Why is it looking there? Is the ordered pattern of the grid an alternative to the free flowing patterns within its own seed head? Is there a wish for order, in the chaos of creativity? Possible. Certainly, there is a need for containment, for my self, which I do feel quite acutely at times. So it could be the wishful thinking of a sun loving flower! rustle of leaves and falling snow. Sound in Silence, Silence in Sound. Further than far, nearer than near. Maybe, mother Jesus. Maybe mother Jesus? Dancer Jesus. Leaper, Prancer Jesus! It was very enjoyable to do this! Oh, it’s just great to have the Studio Tent! The image up here is a bit out of date…It’s in action now, and I use it just for painting in acrylics, and drinking tea and praying in! The sound of the birds is lovely, and the flapping sides of the tent as the wind blows is pretty relaxing too. It’s great to have all the acrylics, pigments, glass beads and fillers, inks, and all the rest all together under one roof, even if it is a tarpaulin roof! 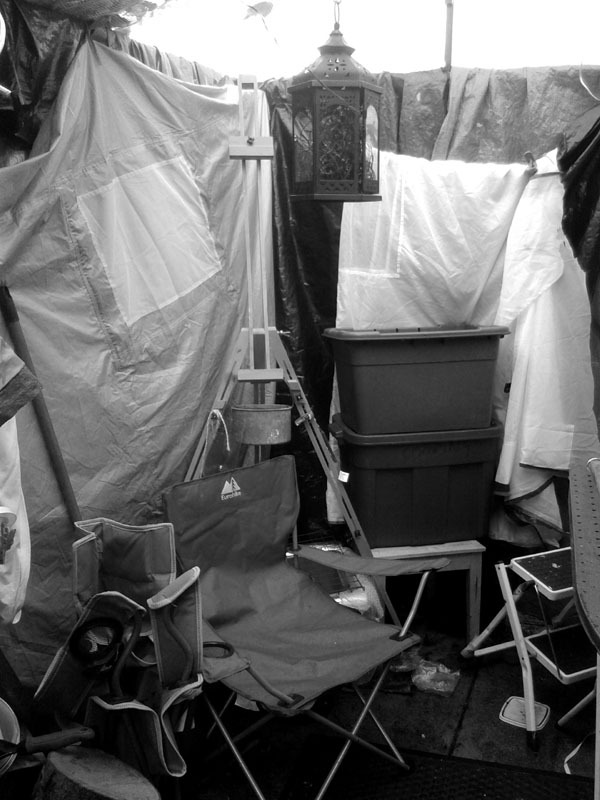 Though not a mobile studio, as Emily Carr’s “Elephant” caravan was, I know I am going to get some interesting painting done within it’s confines! I will post a more up to date image soon. One side of it has become a palette of sorts. Well, not for mixing, but just some examples of the contents of some of the containers, so jolly useful to have up there on the wall. “She experienced everything with uncommon intensity, a factor which fuelled her frenzied periods of enormous output, yet contributed to her self-doubt which led to a lengthy and marked slowdown–some would call it a regenerative hiatus–in her painting. Nevertheless, she pulled herself up out of depression, came to ignore public disregard, surrounded herself with pets, sang hymns to her half-finished paintings out in the forest, and, at fifty-seven, won her way to her most productive and original period of painting, producing the works for which she is most known. And always, always, she was seeking. I THINK this quote is the writing of Susan Vreeland, but I am not quite sure, as it appears on the net on several blogs, but I am doing my best here to credit it. Here is the site link: http://www.svreeland.com/ and see here: http://www.svreeland.com/real-ec.html This is just a small snippet of some very interesting reading, and it is well worth a look at the rest of what Susan Vreeland has written about Emily Carr. I am rather encouraged that it was at fifty-seven Emily Carr experienced her most productive and original period of painting! I have time!!! And, yes, we must always be seeking.. Seeing and seeking! I do think that to have a personal spiritual foundation IS indeed very helpful, and certainly a source of strength. Many creative s and artists find this, and benefit from the continual refreshment and focus that a spiritual direction offers them. Well, one thing is for sure, all the encouragement you can get is needed in order to carry on. This year you can meet me and some of my fellow artists from Kingston Artists’ Open Studios… Studio KAOS 2, at 14, Liverpool Road, Kingston Upon Thames Surrey KT2 7SZ on the following weekends: Saturday 6th and Sunday 7th June and Saturday 13th and Sunday 14th June from 11am until 5pm. This is within walking distance of Kingston Town Centre, and also near Richmond Park. Come along! If you have time, follow the whole Kingston Artists’ Open Studios trail. Kingston Artists’ Open Studios is a voluntary group of artists, and there are many studios open in and around Kingston Upon Thames… A whole trail! The Open Studios event is part of the bigger Surrey Artists Open Studios network event. This series of talks on silent prayer and the Christian contemplative life has been running since 2007 in London’s Westminster Cathedral Hall. We invite a range of speakers, each of whom is committed to the contemplative life; each meeting includes one or more talks, and at least one period devoted to silent prayer. The speakers are invited to concentrate on the value of silence and the possibilities of silent prayer, but they are also encouraged to discuss any or all of the other monastic values of solitude, simplicity and contemplative service. The series is ecumenical in nature; we may in due course include representatives of other faiths. Silence in the City is organised by lay members of the World Community for Christian Meditation and Contemplative Outreach. Our inspiration is the practice of silent prayer itself, and while we hope that this series of talks will continue, its real success will be measured by individuals’ discovery of a method of silent prayer that is right for them. A one day retreat devoted to exploring the healing power of spirituality. The day’s reflections will focus on seven traumas or wounds to which we are all subject as human beings and then go to explore methods of meditation and other steps we can take to help ourselves and others heal from each of these seven wounds. The emphasis will be on the lifelong process of learning to be a healing presence in the midst of the world. Time will be given for brief periods of silent group meditation and discussion of the themes presented. Those in ministry, in the healing professions, trauma survivors and all who are interested in exploring healing power of spirituality in their own life and in today’s world will benefit from this day of prayerful reflection. Be grounded in your experience of who you are as a human being in relationship with others. Take responsibility for the healing that needs to occur there. Have faith in the subtle flashes of spiritual awakening that occur each day. Trust these moments reveal that although you are ego, you are not just ego. You are a spiritual being created in the image and likeness of God who is spirit. Realize that the root of suffering is estrangement from spiritual experience. The root of happiness is spiritual experience. Follow the mystics on the path of prayer and meditation that heals the root of suffering in its origin. Follow the path of the saints in compassionate love that heals the suffering that has found its way into our minds and hearts (facing and working through bodily and psychological suffering in a spiritually grounded way). Learn to live in the axial moment that transcends suffering in the midst of suffering, that transcends death in the midst of death. Devote yourself in prayer, meditation and compassionate love to the lifelong process of learning to be a healing presence in the midst of the world. Be resolved to continue living in this way until the last traces of suffering dissolve in love and only love is left. Venue: Westminster Cathedral Hall, Ambrosden Avenue, London SW1P 0QJ. Refreshments provided. Suggested donation £20. Text from the Silence in the City website. It was lovely last year to have “Well Spring” chosen to be included in the Rethinkyourmind Yellow Book. Anything positive related to mental health matters a great deal to me. My mother was seriously mentally ill for the majority of her life, and my sister also. Though pretty psychologically resilient myself, I do know what it is like to experience anxiety and depression, and also what it means to engage in the processes of recovery from trauma. It’s hard work; long, often painful, and very challenging. Without my engagement in psychotherapy, I know that I wouldn’t have been able to move forward personally myself, at all. So I am eternally grateful for the place I am in now, and feel passionately that projects like Rethinkyourmind have lasting value and influence, and do make a significant difference to many people. This year I entered a couple of photographic images in, and was delighted to once more find my art work selected! 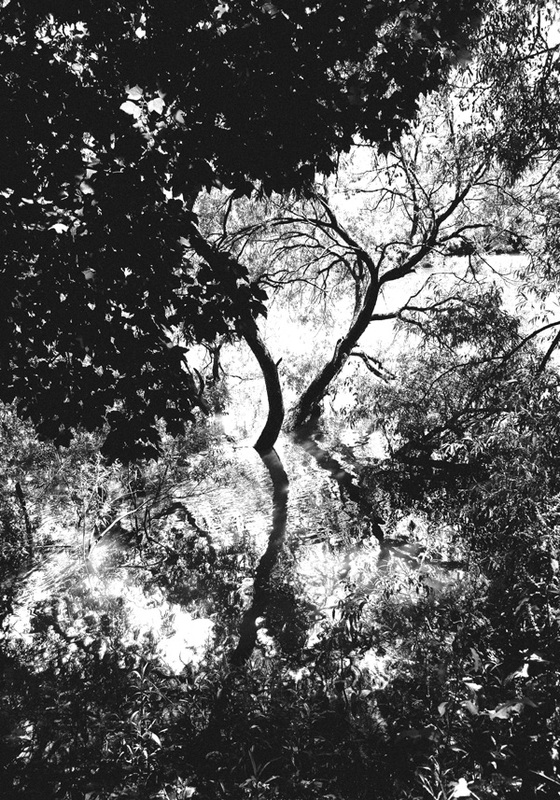 The selected photograph was “I Feel Better When Walking by Trees and Water” (this also has it’s previous title which is “High Water Thames”). “Essentially, fractal systems have many opportunities for growth, change and re-organization. Yet they also are very robust. They maintain their coherence; they hold together well, even under tough circumstances. They are balanced in this respect, between order and chaos. They are simple, yet also very complex. This balance is often referred to as “criticality,” thus the title of the article: “Broadband Criticality.” And the term “self-organized” is often added because systems tend to become fractal on their own, simply by putting a lot of system components together and allowing them to exchange information. Think of a party. All you need to do is come up with enough people at the same place and time and they will start to form complex patterns of connection with one another. Oh wow, well, I hope that my “post-traumatic growth” serves me well…according this the above I may grow even stronger, with more complex connections in my outer branches!!!! This posting is very photography orientated! I am painting, but it is all behind the scenes for now, and a lot of ground laying activity is going on which I don’t intend to post on the internet for some time! I am a very prolific artist, and quite frankly I cannot keep up with bringing an account of what I am doing all the time as well as doing it. At the moment I am doing a lot of organising, taking images of paintings for the archive, tidying up the studio tent, preparing work for this years Surrey Artists’ Open Studios Event, and preparing some more canvases for future paintings. Also, very importantly, as ever constantly reviewing my photography, painting and drawing to see how it can inform me right now. This is probably the most important task. I’ve stopped fretting about representation (finally) and have jumped into the realm of colour, texture and form most fully, without angst. It seems right to loose myself in these eternal layers of colour and texture if that is the way things are going. I enjoy the occasional bit of drawing here and there. It won’t disappear! Copyright in all images by Jenny Meehan is held by the artist. Permission must be sought in advance for the reproduction, copying or any other use of any images by Jenny Meehan. Individuals or businesses seeking licenses or permission to use, copy or reproduce any image by Jenny Meehan should, in the first instance, contact Jenny Meehan. Also, please of course feel free to contact me if you are looking for a particular type of artwork image, as I have a large archive of images myself. I will also be able to let you know the maximum size the digital image is available at. If you then wish to license the artwork image, I then refer you to the Design and Artist Copyright Society to arrange the licensing agreement according to your requirements. Rich, interesting, lyrical abstraction, full of texture, colour, and variations, emotionally expressive and poetically resonant, my expressive paintings are ideal for book cover design and many other design purposes. Licenses for digital images suitable for cover-art for books are really easy and quick to organise through DACS. My artwork is unique and having developed my own direction over the last few years it’s ripe to use. I am relatively prolific, and my main current work centres around painting with a lot of experimentation with layers of colour and texture, though I have a lot of digital photographic (tending towards pictorialism) imagery too. If you need any further clarification, the DACS website is clear and very helpful indeed, and they would be happy to help you. Offices are open 0930 – 1700 Monday through Friday.